Are you nervous about your baby’s first flight? Flying with a baby or toddler can be very demanding, indeed, unless you are enjoying the benefits of a TSA pre-check. That is why we are here to share a few essential tips for a smooth, safe, and stress-free trip with your baby on board. These guidelines will ensure both your peace of mind and your baby’s comfort. Handling the baggage your child requires is crucial. We have touched on this matter in our post about packing for overseas travel with children. To put it briefly, here are our ultimate pre-departure checklist ideas. Food Supplies, Water & Plastic Feeding Set: along with baby food and breast milk bottles, don’t forget about other necessary utensils. Extra Diapers & Diaper Bag: consider taking a diaper for each hour on the road, plus extras if there will be delays. Pacifiers: keep a pacifier handy as it helps reducing ear pressure. Extra Clothes: pack around two outfits per day, just in case. Consider extra shirts for you too. Blankets: you also need a few blankets – one to lay your infant on, one to cover him or her during the flight, and one for you if you are nursing. Small Bottles containing baby wash, hand gel, and anything else you generally use and consider will be of help. Sling or Carrier: this will prove most useful as it keeps your hands free. Energy Snacks for the Mom: yes, you need to take care of yourself too. Portable Crib & Collapsible Stroller: these will be checked at the gate. You will be asked to drop them at the end of the jet-way, and pick them up at landing along with the rest of your checked baggage. Car Seat for a safer flight. Digital Camera: think ahead of all the memories you want to capture. Books and clip-on reading light: if it’s a long flight ahead you may get a few moments of peace and enjoy doing something for yourself while your baby is sleeping. Prior to booking your seat, consider what the best option is both for you and your baby. 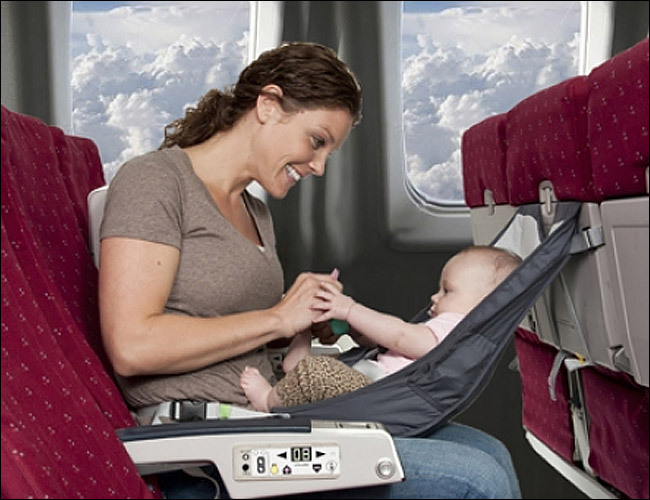 Will you be flying with your infant on your lap or buy a ticket for your little one too? Well, for newborns and even for infants aged 3 – 6 months, it is easier to travel with them as lap-carried kids. However, during turbulences, your baby can fall out your arms. That is why, both the American Academy of Pediatrics and the Federal Aviation Administration recommend using an FAA-approved car seat, or a child restraint device. Having a separate safety seat and seat belt meant for your baby ensures his or her safety during your flight. About the location of your seat, consider reserving an aisle seat as close to the front of the aircraft as possible. This will allow you quicker access both when boarding and deplaning, as well as enhanced mobility during the flight. The time of departure is also important. Try to arrange a flight during nap time, or even during the night, so your baby will get some sleep. A valid passport: note that applying f for a first-time passport requires extra documentation, time, and patience. A proof of age for all infants under age two: that would be the birth certificate. A medical release for infants younger than 14 days. We know that minimizing the risks of injuries or infections is your main concern, but there are other aspects to consider as well. Here, we refer to the comfort of both your baby and other passengers. Early infancy is a challenging time of transition both for you and your newborn. Now you establish feeding and sleep routines, and traveling may have an adverse impact on these two. As long as you make sure you will be able to feed your baby, and he or she gets a lot of rest, it should be safe and comfortable to travel. Also, one of the most stressful things when flying with an infant is to maintain a pleasant experience for everybody around you. Most people will understand if your baby cries and expresses his or her discomfort while travelling by plane, but it is crucial for you to maintain calm and be as polite as possible to your fellow passengers, even those who may raise some complaints. Whenever necessary, ask for help; a flight attendant should be able to assist you especially if you’re travelling alone with your baby. Take your baby’s favorite toys and blanket to keep him quietly busy and entertained. Maybe he or she likes an interactive book or a bright colored plaything. Anything that works well at home to stimulate your kid and keep him or her quiet at the same time has excellent chances to work well while on the plane as well. The goal is to keep them in their seats for as long and as behaved as necessary. Remember, you have your fellow passengers to take into consideration, so you don’t want your baby to get cranky during your flight. Now that packing is done, and the required documentation arranged, there are just a few more things to clear up. Southwest Airlines, for instance, provide their customers with useful information about flying with children under two years of age. By checking their customer service page, you will learn more about how to enhance your baby’s safety on aircraft. Babies under two years of age or lap infants, as they are commonly referred to, can be carried free of charge. This means you do not need to get a boarding pass for your little one. However, you will need to acquire a Boarding Verification Document. Also, note that only one lap child is allowed for every adult. Although booking separate seats for your babies is optional, always take into consideration the benefits of doing so. You can also reserve a seat for your baby and use an FAA- approved car seat. In such case, a boarding pass is required, but airline companies offer affordable infant fares that are typically discounted from a full adult fare. It is best to check their official page and applied rules. As regards the check-in, the age of the baby has to be verified. Different airlines also have varying policies when it comes to offering baggage allowance or carry-on allowance for a baby car seat stroller, baby carrier, car seat, and diaper bag. So, you will have to talk to your airlines about these as well. For example, bringing a stroller on the airplane may require you to secure it inside a stroller bag before you have them gate checked. You can bring your own or purchase from your airline if available. Also, while a baby carrier is not restricted on board, the general rule is always to remove your child from the baby carrier during takeoff and landing. When traveling with your baby on an international flight, the same rules apply if he or she does not occupy a seat. You will be required, though, to pay the taxes and fees for the international portion of your baby’s itinerary. Please note that you have to pay these before your travel. For more information on fees and required documentation, we recommend you to check the official website of the airlines of your choice. Specific details will be provided to you. Also, for long-haul flights, it is strongly advised to contact your airlines about reserving a bassinet for your baby as they may be subject to availability and under a first-come-first-served policy. 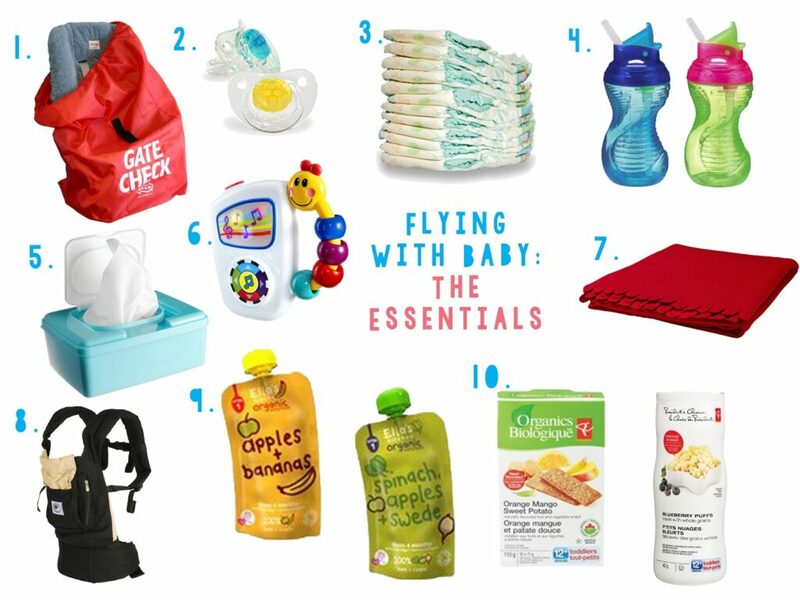 What can you bring when flying with a baby? Aside from those mentioned under our pre-departure checklist and required documentation sections, there are other things you can bring when flying with a baby. Although bringing liquids on the plane generally comes with restrictions, the same does not apply to medically-required liquids, like breast milk or formula milk, even in large quantities. Makes sure to have them ready for inspection once at the airport security. This may not apply to everyone, but if your traveling solo, you may be required to bring a letter of permission from the other parent whose not coming with you. Flying with a sick baby? If your child is not well on the day that you’re scheduled to fly, you need to take extra care to make the whole flight as comfortable as you can for you and your baby. But first, check on your pediatrician before traveling to ensure your baby’s safety. If your pediatrician approves, don’t forget to include your baby’s medication in your carry-on items. Also, keep in mind that sick babies will have a harder time dealing with the pressurization inside the airplane, particularly during takeoff and landing. We all know how such pressurization can easily cause some discomfort in the ears. So, parents are advised to feed their babies during those times to reduce the pressure in their ears. The same principle applies if you have a young toddler with you. What time is best to fly with a baby? As previously mentioned, it would be ideal to book your flight that corresponds to your child’s sleeping time. Hence, this can greatly vary depending on the exact age of your child. Most babies tend to wake up early, so with that in mind, you can strategically book a flight that will give you enough time to get ready, get to the airport, and takes off in time for your baby’s morning nap. An 8 AM or 9 AM flight, for example, are some good choices when flying with babies as they are not too early and not too late in the day. Hence, there’s a good chance that during these hours, babies will be sleeping soundly on their seats or your lap. What kind of ID does a child need to fly? This will depend on your destination, airline of choice, and the age of your child. Domestic flights generally don’t require additional IDs for minors as mandated by the TSA; a boarding pass is good enough. However, there might be instances when you need to provide a birth certificate as your child’s identification, like when you’re traveling with an infant or if your child is under two years old. Also, other airlines might require additional IDs especially if you want to avail of a discounted booking for children. For international flights, passports are always mandatory. If you’re traveling to a country that requires a Visa and you’re flying with a baby, you may need to check that country’s specific requirements for your child’s identification and other documentation before even booking a flight. There is no denying the fact that traveling with a baby is both a struggle and a fun experience at the same time. For one, there is that familiar set of diapers, baby food, baby carrier, milk bottles, toys and whatnot in your luggage, leaving very little space for your personal belongings. Next, you’ll have to go through the check-in counter and x-ray machine or scanner before you can head to your departure gate. Flying with an infant is such an unpredictable experience. There are so many things that can get out of your hands from leaky diapers to endless crying sessions. But keep your enthusiasm high! Your baby’s first flight is an important event that will contribute to your parenting experience and will help you build your self-confidence. Safe flying!